After twelve games into this season, the score consisted of 0 points, 5 goals scored, 31 goals allowed. It’s easy for newly promoted sides to struggle in Serie A but nobody expected the degree of pain Benevento suffered in their first ever season in the top tier. Instead, Benevento endured hard time keeping up with Serie A giants. A small budget club, Campani spent €20 million on new players this summer, although they have been distributed, with young centre-back Andrew Gavrillon being the most expensive acquisition at €4 million. No other promoted side suffered these setbacks and collected as few points than Benevento so the whole consensus over them were that they will end up the season being relegated. But Benevento didn’t give up. In order to avoid going down, the club dismissed coach Marco Baroni and sporting director Salvatore Di Somma, preparing themselves to a roster overhaul this January. However, things improved in recent weeks with the new coach Roberto De Zerbi and the planned turnaround could be decisive in terms of how the season could go. With 31 goals allowed, De Zerbi inherited a side that were the worst defence in the league. Benevento showed a clear lack of defensive skills conceding goals close to the end of the games. To fix it, De Zerbi worked both on his team psychology and on the tactical aspects of the game. From a tactical point of view, the new coach insisted on the 4-4-2 and 4-1-4-1 utilised under the previous regime but put more emphasis on remaining sufficiently compact vertically and even horizontally without the ball. This has been particularly important since Benevento were disconnected in pressing under Baroni, resulting in large spaces between the midfield and the backline that was targeted and hit by opponents. So easy was for the opponents to play through Benevento’s midfield that giallorossi was pushed back into their own territory, which also resulted in a low possession rate – arguably the worst average in the league. Furthermore, under Baroni the team were unable to adjust themselves to the position of the ball which resulted in an extreme difficulty of going forward. As a result of these poor defensive movements, team’s vertical compactness vanished and the opponents were able to build large spells of possession in the final third of the pitch. Pressing situations also were easily beaten by the opponents. De Zerbi is well-known for positional play with which he built one of the best Italian sides at Foggia. De Zerbi’s Foggia were very organised offensively. However, they showed a lack of knowledge on the defensive side of the ball, but they still were able to overcome them due to the way they aggressively pressed. The ball should be conquered as quickly as possible to bring out the positional game. At Benevento, De Zerbi found an organisation that is basically not that bad and he started to build something out from. When in possession, De Zerbi looked settled on a 3-4-2-1 formation. The offence starts with a build-up in their own third as the coach is a strong believer in building from the back. Under De Zerbi, Benevento. The centre-backs position themselves wide open while the central midfielder stays in front of them. The ball is played either by the goalkeeper in order to create a numerical superiority whilst the full-backs provide width. To hit this goal, De Zerbi utilised full-backs such as Gaetano Letizia, Lorenzo Venuti and Gianluca Di Chiara which are fast, intelligent and technically skilled enough to support team’s passing game. Shouldn’t be suitable options, the long ball is settled although generally De Zerbi wants his side moving the ball on the ground from the back, including when the opposite is counter-pressing. In the opening stage of possession, isn’t unusual to see De Zerbi using three at the back with a wing-back moving high up the pitch, occupying his sideline. That’s a hybrid four/three-man backline basic to their organisation. The goal remains to get the ball progress out from the back. 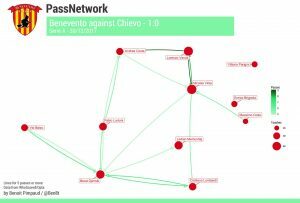 This pass map produced by @Ben8t shows as Benevento failed to exploit some passing lines in the game against Genoa. This is risky as it can lead to some ball losses in their own half, but the advantages are greater for De Zerbi though. In fact, moving the ball from the back through the midfield allows Benevento to overcome the opposite’s pressing, finding plenty of spaces beyond the opposing first line of pressure. This allows Benevento to get forward by combination play. In addition, playing long balls could result on opponents easily regaining ball control, resulting on long phases of continuous attacking. De Zerbi also can rely on some decent playmakers in both Danilo Cataldi – a former interior midfielder who’s comfortable with the ball at his feet – and Viola which provide the needed passing skills in the team’s offensive structure. Cataldi and Nicolas Viola provide the linking play to the players up being also able to execute diagonal passes. 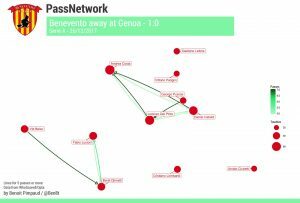 The @Ben8t’s pass map showing how Viola is becoming a playmaker into Benevento’s structure. When defending, the 3-4-2-1 can become a 4-5-1 or also a 5-4-1. De Zerbi’s instructed his side to playing both a four-man backline and a three at the defence. A key part of Benevento’s improvement under the news coach has to be credited to Fabio Lucioni, which come back strengthen the backline. The team’s captain provided a better defensive compactness and also is a charismatic player who can rise the level of play of his teammates at the back. The defensive-oriented Raman Chibsah and Ledian Memushaj added some more stability in the midfield although they are lacking in Serie A appearances. The whole defensive structure in midfield slightly improved. De Zerbi usually changed his midfielders’ positions with Cataldi, Memushaj and Viola acting as six, eight or ten according to the situations. Against Milan – in the famous game in which Benevento gained their first ever point in Serie A thanks to a header from goalkeeper Alberto Brignoli – De Zerbi lined up Cataldi as six. Against Sampdoria, the lineup basically remained the same, although De Zerbi instructed his interior midfielder Enrico Brignola to take a close look to Sampdoria’s playmaker Lucas Torreira. The game plan was clear: let Matías Silvestre – Samp’s left centre-back – build from the back but prevent Marco Giampaolo’side from rely on Torreira. 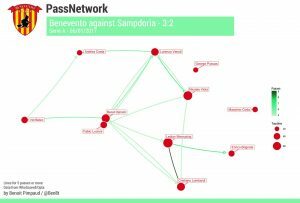 The pass map kindly provided by @Ben8t shows us Benevento’s players verage positions against Sampdoria. These tactical solutions showed how much De Zerbi is a student of the game who spend hours studying the film on order to maximise his team’s strengths and find opponent’s weakness. So, whilst it isn’t hard to identify De Zerbi’s general line up, much harder is figure out what he’ll do with his match plan as the coach adjust his team approach to the specific opponent. Although De Zerbi’s approach follows some patterns, there is no a strict way Benevento’s coach runs in a game, providing his side with a certain level of unpredictability. Generally speaking, De Zerbi stays faithful to his basic principles – building from the back, move the ball fearless – but models the game plan according to the opponent. It means Benevento can be committed to vertical passing but also enjoy longer amount of possession. Both these situations allow Marco D’Alessandro to exploit his speed and skills in the wider zones. Former Atalanta midfielder can also thrive on the half-space, floating around the no.9. In fact, in De Zerbi’s system the wingers can remain close to the touchlines but also move from there during the offensive construction. In the latest week, the centre-forward spot has belonged to Massimo Coda, who scored three goals out from three games. The journeyman forward Coda is on fire right now. Not bad for a player who was expected to be sold after some clashes between his agent and De Zerbi. At the moment in which these lines are written, we don’t know how January market will evolve for Benevento. The only sure things look to be the transfer of Chibsah to Frosinone and the acquisition of former Tottenham midfielder Sandro. The 28-year-old Brazilian should be lined up in the holding midfielder role. It means he should primarily be responsible for covering the players at his back and also supporting the teammates in front of him. His role could be crucial to link the defensive players with the offensive ones and also because he could allow De Zerbi to line up Cataldi into a more advanced role. Until la Befana, Benevento’s hopes of surviving were practically non-existent but Crotone’s big escape last term gives Sanniti hopes. Benevento’s false start has made people forget that their roster, on the paper, weren’t weaker than the ones of other sides fighting to survive. Benevento’s current xG (18.64) are better then Crotone’s expected goals and close to Bologna’s xG. It means there could be an improvement when it comes to their offensive production. De Zerbi’s ability to make the best out from the players at his disposal and some addition through the market could further reduce the gap between Benevento and their competitors.